The Limon Leader / Eastern Colorado Plainsman: More wind towers coming to Lincoln County! More wind towers coming to Lincoln County! 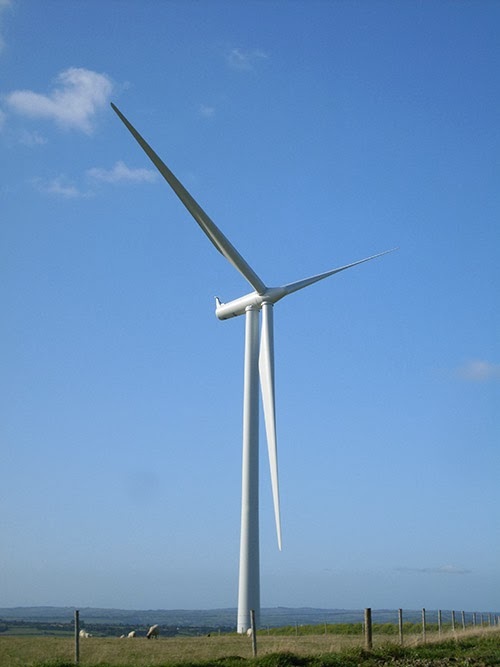 More of those gigantic wind-energy turbine towers are going to be erected in northern Lincoln County starting in the spring of 2014 after a decision by the county commissioners during their final meeting of 2013. By a unanimous vote at their Monday, Dec. 30 meeting, the commissioners approved a Use By Special Review and Development Permit for the construction of Limon 3, the third phase of the NextEra Resources’ wind energy project in Lincoln County. The company’s Limon 1 and 2 projects were completed in 2012 and are currently in operation. In approving the development permit, the commissioners acted upon the recommendation of the Lincoln County Land Use Board which held at public hearing on the application for the Limon 3 project on December 19. The Limon 3 project will be built over a 49,600-acre area of Lincoln County north of Interstate 70 between the towns of Genoa and Arriba. During the December 30 meeting, Land Use Administrator John DeWitt presented the Land Use Board’s recommendation to the board. Also present was Tricia Hale, NextEra’s project manager, and Tony Ryan, the company’s attorney. Hale told the commissioners the number of towers per acre for the new project will be less than NextEra’s previous wind-energy farms in the county. During the discussion on the permit, the commissioners raised concerns about the property owners access to their mineral rights on land around the wind towers. Some disputes over this issue occurred during the construction of Limon 1 and 2. Todd Ritchie, a landman for Cascade Petroleum of Denver, was also present to express his concerns about the mineral rights issue. He raised questions about seismographic testing and the distance that would be allowed for the placement of oil/gas drilling derricks from the wind turbine towers. Hale and Ryan assured Ritchie and the commissioners that NextEra will conclude agreements with the landowners and the oil-and-gas developers prior to the start of the construction of Limon 3. These agreements will include the joint use of roads to be constructed for the project. Hale said the anticipated start of construction of Limon 3 will be late March or early April. At the peak of construction this year, 200 to 250 workers will be employed on the project. NextEra’s Limon Wind 1 and Limon Wind 2 projects, located north of I-70 between Highway 71 and the town of Genoa, were completed in October 2012. Their combined 250 turbine towers generate up to 400 megawatts of electricity. When Limon Wind 3 is completed later this year, northern Lincoln County will have about 500 wind turbines located in it. Prior to the construction of NextEra’s project, the 139-tower Cedar Point Wind Energy Project owned by Enbridge, a Canadian-based energy corporation, was built and began operation in September 2011. The Cedar Point project is located directly west of the NextEra project across Highway 71. In other business at the December 30 meeting, the commissioners met with James and Elizabeth Martin of Evergreen Systems & Technology, LLC on volume licensing of computer programs installed on the computers used by the county employees. They explained this would simplify the programming of the computers and increase their compatibility with one another while at the same time reducing the cost to the county. The commissioners agreed to the proposal and told the Martins to come back with a price quote for the volume licensing. The commissioners also opened the bids for chemical spraying to control noxious weeds in the county. They accepted the one from Tri-Me Spraying of Arriba for the 2014 spraying season. Lincoln County Administrator Roxie Devers brought up the issue of the use of the county fairgrounds by the Lincoln County 4-H organization for shooting sports. Because it is a local club, she said it is not covered by the county’s insurance in case of an accident. Devers pointed out the annual Summer Bible Camp also uses the fairgrounds for shooting sports, but it has its own insurance. County Attorney Stan Kimble agreed with Devers that 4-H is not covered by the county’s insurance and should be notified. Also during the meeting, the commissioners met with rancher Jay Jolly who expressed concerns about the official designation of floodplains in unincorporated areas of Lincoln County. In response, Kimble said the county is required to map potential floodplain areas under a federal mandate whose deadline is the end of this month. Failure to comply would make the county ineligible for Federal Emergency Management Agency (FEMA) grants and other federal/state programs. To fulfill that federal mandate, the commissioners have contracted with JR Engineering of Colorado Springs to complete a hydrology study for the southern part of Lincoln County. Its completion is necessary for the county to receive a FEMA grant that will help pay for the replacement of two bridges and other road repairs damaged by the September flooding. Also at the December 30 meeting, the commissioners reviewed and approved the mill levy certifications of all the municipalities and districts in the county for 2014. See the Northern Lights TONIGHT!